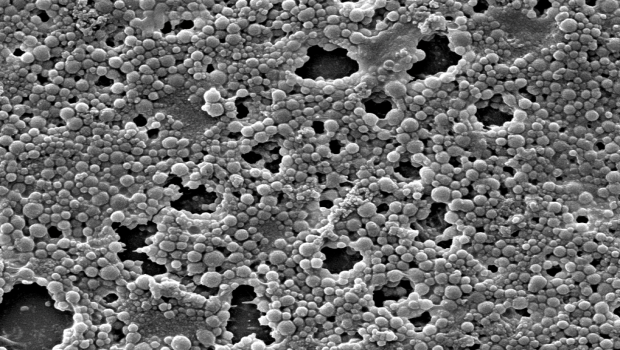 What’s unique about biofilms is their antibiotic-resistant and polymeric structure? Their robust structure is formed of free-floating bacteria localized on a foreign body. This concentration of microorganisms creates an exopolysaccharides (EPS) protective matrix inclusive of DNA, proteins and polysaccharides allowing the bacteria to thrive, evolve and develop resistance to a wide range of antibiotics (Draelos & Draelos, 2013). A relatively new concept is the role of biofilms in dermatological cutaneous procedures. In 2017 the American Society of Plastic Surgery (ASPS) reported that there were 2.7 million soft tissue filler procedures performed in the US (ASPS, 2018, p. 3). Injectable dermal fillers, ranging from polymers to micro-particles, have been known to induce adverse reactions including hematoma, asymmetries, skin necrosis and also allergies or infections (Dumitraşcu & Georgescu, 2013). Many of these complications, conversely, were incorrectly attributed to autoimmune reactions. However, when treated with steroids or large doses of non-steroidal anti-inflammatory drugs, the results yield full-blown abscess and fistula formation (Bjarnsholt, 2013, p. 19). We see these outcomes because biofilm microorganisms are crafty. Biofilms are difficult to culture in vitro and when the cell metabolism of biofilm shuts down, it can live in a dormant state out of reach by antibiotics (Dumitraşcu & Georgescu 2013) leading to the idea that they are inflammatory defenses. Proof of their infective etiology, however, has been provided by Dr. Thomas Bjarnsholt’s article which showed detection of bacteria by fluorescence in situ hybridization in gel filler and surrounding tissue in 7 out of 8 biopsies, which were all culture negative (as cited in Sadashivaiah & Mysore, 2010). We actually see that bacteria can become active following any disturbance in its local environment, such as trauma, injection or manipulation as described by Narins, Coleman and Glogau (as cited in Sadashivaiah & Mysore, 2010). Infectious granulomas result when bacteria from the skin’s surface find their way into the dermis by way of a filler-loaded needle. Research is now attributing these events to biofilms, particularly occurring after administration of injectable fillers (Draelos & Draelos, 2013). 1. Dumitraşcu, D. I., & Georgescu, A. V. (2013). The management of biofilm formation after hyaluronic acid gel filler injections: a review. Clujul Medical, 86(3), 192–195. 3. Bjarnsholt T. (2013). The role of bacterial biofilms in chronic infections. APMIS 2013, 121 (Suppl. 136), 1–54.